Brightcove technology partner Cleeng helps its customers to generate more revenue per viewer through its integrated digital content e-commerce platform. It seems that everyone is doing it - the President, Lady Gaga, many major sports teams, as well as businesses of various sizes. All types of publishers are taking advantage of live stream events to communicate instantly with and engage a global audience on all devices. Although the possibilities and communication benefits are obvious, the monetization part of live streaming is still seen as challenging. Despite the fact that live content generates 6x more revenue per user than VOD generates (according to what we experience across Cleeng VOD and live publishers), our recent survey of 70 publishers showed that 9 out of 10 randomly chosen live event organizers find that setting up a live pay-per-view (PPV) event is too complex, too costly and generally too much fuss. Why does Live Pay-Per-View implementation remain challenging? Securing video access across devices while maintaining a quality user experience is difficult, due to an explosion of smartphone and smart TV standards, as well as fragmentation of technologies such as Flash and HTML5. Managing pre-booking and making sure people can connect at "go time" in one click is not a trivial endeavor. Consumers expect social logins and a very high standard of ease-of-use. For paid content, delivering a "TV-Like" live video experience is a must and remains difficult; only 45 percent of viewers are truly satisfied when accessing videos across multiple devices. For event organizers, often the opportunities lie with opening in new countries, but it can be difficult to confidently control geo blocking and manage efficient payment processes. And, finally, the setup is often consuming and costly. It can entail working with multiple agencies and partners to make it happen, from page creation and promotion, to user support during the event and reporting. With more than three years of experience in monetizing digital content as Brightcove's tech partner (for such customers as Viaplay and Cirque Du Soleil), we decided it was time to make live PPV events accessible and profitable for everyone. That's how Cleeng Live! was born. Together with advanced Brightcove Video Cloud technology, Cleeng Live! is aiming to knock down live PPV complexity. How will the integration of Cleeng Live! 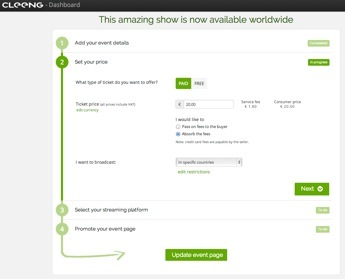 and Brightcove Video Cloud help you to take advantage of simple live stream monetization? Using Brightcove's cloud encoding solution, joint customers will reduce production costs and deliver an optimal experience to all viewers. Cleeng Live! 's simplified set up and workflow saves time and energy. Publishers can start pre-booking in just two minutes! Finally, when the live event is over, it's easy to offer it again as a video on-demand (VOD) asset - thanks to Brightcove's VOD playback and Cleeng's VOD and subscription toolkit. You can set up your first event here--give it a try and let us know what you think in the comments. Cleeng's strategy, models and results have mainly been driven by the hard work of Gilles Domartini. While working for some of the world’s leading technology firms, such as Phillips and Apple, Domartini collected his thoughts and was able to see the end result – Cleeng. Since then, Domartini has looked to perfect ways to make content profitable through Brightcove Video Cloud and to help broadcasters get the most out of their streaming content. To keep up with all the latest news on Cleeng, visit the company's Twitter page. More information about Gilles Domartini’s monetization methods can be found here.